This project assumes a basic level of electronics proficiency and knowledge. To build the Sound Lab Mini-Synth you must be able to read and understand schematics, relate schematics to physical components, solder, do panel wiring, case building, and very importantly be able to troubleshoot the finished project. The Sound Lab Mini-Synth project does not have step-by-step instructions to follow. There are: schematics, circuit descriptions, pc board layouts, suggested panel layouts, and suggested modifications. Please browse all the Sound Lab information before attempting to build one to make sure there is sufficient information for you to succeed. If you are interested in electronics or are just getting started in electronics check out this page for some ideas to help you get going: How Do I Get Started In Electronics? This project is fun for someone with intermediate to advanced electronics skills who wants to make cool sounds. It makes a great first synth project but is interesting enough for the seasoned synth-diyer too. The board includes 1V/oct scale adjustment trimmers for the oscillators You will get a couple (maybe three) octaves of in tune scale. If you have a sampler you can use this unit as an analog synth sound source to make excellent samples with. Some of the wiring is done on the chassis but the drawing I have included will make it very easy for you to do a neat job while you build it. Tom Fenn of Birmingham, UK. It will help you imagine the sounds you can make. How much will the Sound Lab Mini Synth parts cost? Well that depends on where you buy your parts. If you look for deals on pots and switches (which will most likely be the most expensive items) you may be able to find them for as little as 50 cents a piece. Try All Electronics for surplus pots and switches. Jameco sells brand new pots for about 90 cents when you buy ten pieces of the same value. Also keep in mind that a DPDT (Double Pole Double Throw) switch may be on sale when you need a SPST (Single Pole Single Throw) switch. Well a DPDT switch can be used in place of an SPST or an SPDT (Single Pole Double Throw) switch. So don't pay more for an SPST or a SPDT if you find cheap DPDTs. Another example is dual pots. If you find cheap dual pots in the value you want they will work fine as single pots. A dual pot is a pot with two resistive elements, two wipers connected to the same shaft and two sets of terminals (they are typically used as stereo controls). You just use one set of the terminals as if it was a single pot. Resistors and capacitors are relatively cheap but they are only pennies a piece if you buy in bulk (100 or 200 at a time). Values like 100K, 1M, 10K, .1uF, .001uF, 100pF always come in handy as do 1N914 diodes, 2N3904 NPN transistors and 2N3906 PNP transistors so having a few extra around for future projects and experiments is good and you will pay a lot less per part. If you belong to an electronics club or have some electronics buddies that live near you go for bulk buys and split the cost. OK, all that having been said I think that the price for parts will range from about $70.00 (you stock parts that you buy in bulk) to $100.00 (you buy just what you need for a particular project). Here are some good places to order parts from (most have on-line ordering). If within 30 days of the original purchase you are unsatisfied you can return the clean, un-marred, un-soldered board and I will refund the purchase price of the board. You must include the original email you received from the on-line payment service regarding the transaction and pay for the cost of shipping it back to me. Please remember that the only stipulation to this offer is that the board must be in the same condition as it was when I sent it to you (clean, un-marred, and un-soldered). You can return it to me in the same envelope you received it in if you don't open it or if you open it carefully and tape it back together securely. There will, of course, be no refund if I receive a damaged board or an empty envelope. Paste my address on the outside and when I receive it I will issue a refund to you of the purchase price using the same on-line payment service used to make the purchase. If within 30 days of the original purchase you are unsatisfied you can return the clean, un-marred, un-soldered kit and I will refund the purchase price of the kit. You must include the original email you received from the on-line payment service regarding the transaction and pay for the cost of shipping it back to me. Please remember that the only stipulation to this offer is that the kit must be in the same condition as it was when I sent it to you (clean, un-marred, and un-soldered). You can return it to me in the same box you received it in if you tape it back together securely. There will, of course, be no refund if I receive an empty box or a damaged or incomplete kit. Paste my address on the outside and when I receive it I will issue a refund to you of the purchase price using the same on-line payment service used to make the purchase. Some Optional Sound Lab Improvements. Some optional improvements to improve the quality of your Sound Lab. Turn your Sound Lab Mini-Synth into a guitar effects box. Turn your Sound Lab into an excellent electronic drum. Build this on a small Radio Shack breadboard and add it to your Sound Lab. Its a great little source of variety. Need more CV inputs not a problem. Here's how. As a result I've achieved different and cool sounds (may I say almost limitless). 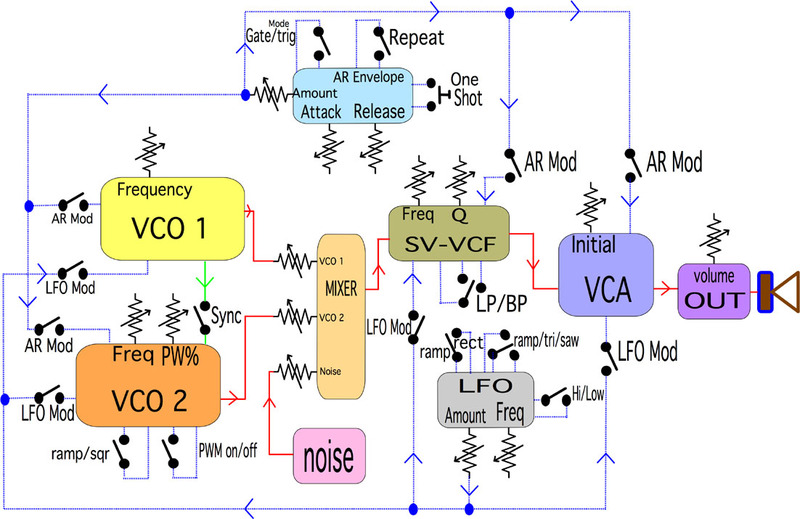 I'd be glad if you could publish the modifications in order to share with the electronic music enthusiasts, synth building world and DIYers community like me and all over the place as you said. Carlos has given permission to contact him if you have questions concerning the mod. Email him at adrianopy2qa	AT yahoo DOT com. The Sound lab is normallized with switches to set the connections between modules but you can use banana plugs and jacks and connect whatever you want to connect to get the most out of the modules. Make some cool modulation effects: birds, bells, etc. 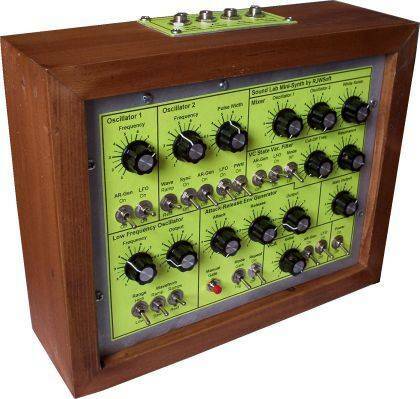 by modulating Oscillator 1 with oscillator 2's output. Fine tuners make it WAY easier to tune the oscillators to set intervals. The coarse adjustment provided by the original pots works but if you want to use the unit for music you will want to add the fine tuners. When printing these pages You need to set your page orientation to landscape and set the margins as low as they will go. If necessary use cut and paste to put the larger images into your word processor or image editor and then print them from there. I have not been able to figure out why Internet Explorer adds several blank pages (does Bill have stock in some paper companies?). Be aware of static electricity when handling the ICs and transistors for the project. Just walking across a carpeted floor on a dry day can charge you up with tens of thousands of volts of static electricty. If this energy jumps from your hand to your active component (IC or transistor) you may damage it so badly that it doesn't work anymore. To avoid this, discharge yourself before handling ICs or transistors. You can buy grounding straps that you wear on your wrist which are connected to earth ground VIA A 10 MEG RESISTOR. NEVER STRAP YOURSELF DIRECTLY TO EARTH GROUND!!! You can also buy discharge pads in computer stores. You touch the discharge pad when you arrive at your work station and thereafter touch it again from time to time to stay discharged.